Well, the winner is . . . Woman In the Middle! Check out her blog, congratulate her, be jealous, et cetera. My favorite recent post of hers is one about her favorite 1980s Christmas present. Enjoy! And now, I should really try to stop blogging about Perry the Platypus. The search engine powers that be are sending all kinds of Perry seekers here, whether they are looking for Perry hats, pants, or desserts. 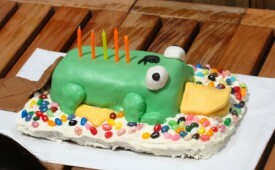 Speaking of Perry desserts, if anyone would like to follow the tutorial and make this cake, I would love to hear all about it.